A plan of Grange Farm 'Lots 29 to 31' from the court documents, image supplied by Paul Ford/Walsall Local History Centre. Paul Ford, researcher at Walsall Local History Centre and top blog contributor has once again excelled himself and ferreted out a top piece of local history from Walsall’s extensive archives. Paul has kindly offered to make this a reasonably frequent occurrence as he notices things we might be interested in. This is a fantastic thing for readers of the blog, and a true act of generous felicity. I’m sure readers will join with me in thanking Paul for his time and keen eye for historic detail. In the following piece, Paul highlights the unsavoury history of an area covered in the recent posts referring to the Green Lane/Bullings Heath area. I’m interested in the history of local drainage and sewerage too, so this article covers several angles. I saw the recent piece on the toxic land and thought of this – which is collection Acc1399 in the archives. The defendent's brief - a time piece in itself. Image supplied by Paul Ford/Walsall Local History Centre. This collection relates to a court case, held at the Birmingham Assizes on the 30th November 1921, between Emma Snape, Arthur John Snape and William Thomas Edwards, the executors of Albert Henry Snape deceased, farmer of Grange Farm, Walsall Wood (plaintiff) and the Brownhills Urban District Council (Defendant). The case may have sprung from an earlier case, dated 1913, between Snape’s neighbour, Samuel Brawn and the UDC. The essence of the action taken by the plaintiff was that the Ford Brook, which flowed through Grange Farm, was, since 1920, being polluted with sewage from the Council’s sewage works just up-stream, which was then being imbibed by plaintiff’s cattle and horses, causing sickness, a reduction in milk output and a depreciation in their value. 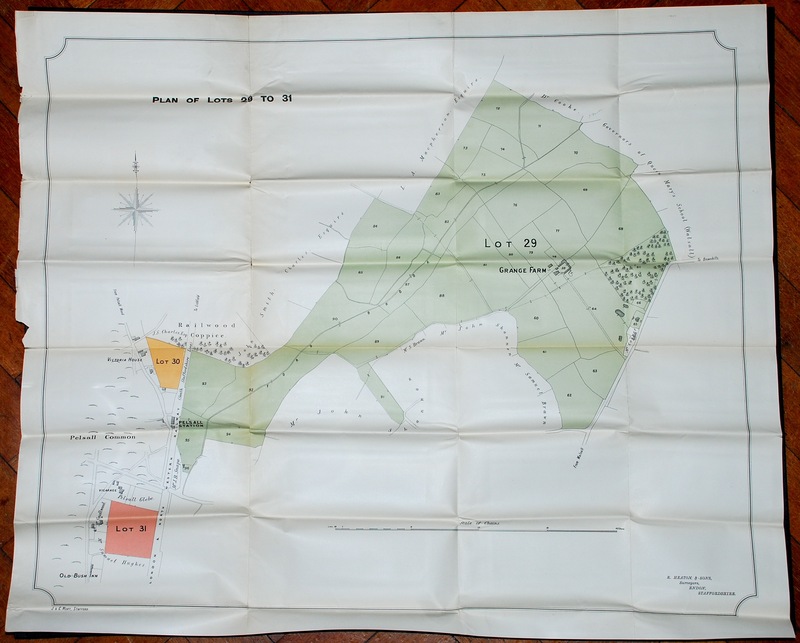 Grange Farm had been offered to the Council in 1904 (see plan and schedule pics) at a cost of £80 per acre. The sewage works had opened in 1882, I believe. Albert Paley, the veterinary inspector for Walsall inspected the animals and found them in poor condition and the stream clearly polluted. 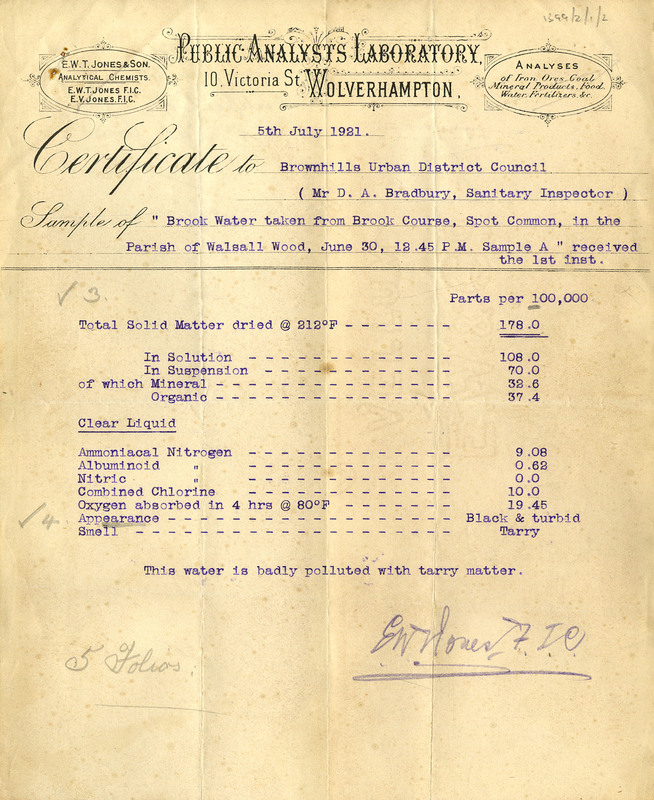 Indeed, the UDC had tests at the County Analyst’s Labs in Birmingham and Public Analysts Lab in Wolverhampton on the stream water (see picture), which proved it was heavily contaminated. Tarry matter - that's the worst sort. Yuk. image supplied by Paul Ford/Walsall Local History Centre. The defence put forward by the UDC (see picture of defendants brief), championed by Sir John McFadyean, principal of the Royal Veterinary College, London, was that the pollution would not harm the animals, but that his tests showed that one animal died from Johnes’s disease, also called paratuberculosis, which is a contagious, chronic and sometimes fatal infection that affects primarily the small intestine of any hooved animal that digests its food in two steps, first by eating the raw material then regurgitating and eating a semi-digested form known as cud. The plaintiff claimed £788 in damages, but although the judge found for the plaintiff, he only awarded costs and damages of £150. The UDC also cleaned the stream, as tests at the County Analyst’s Labs in Birmingham showed, as by 1923, the stream was far less polluted. 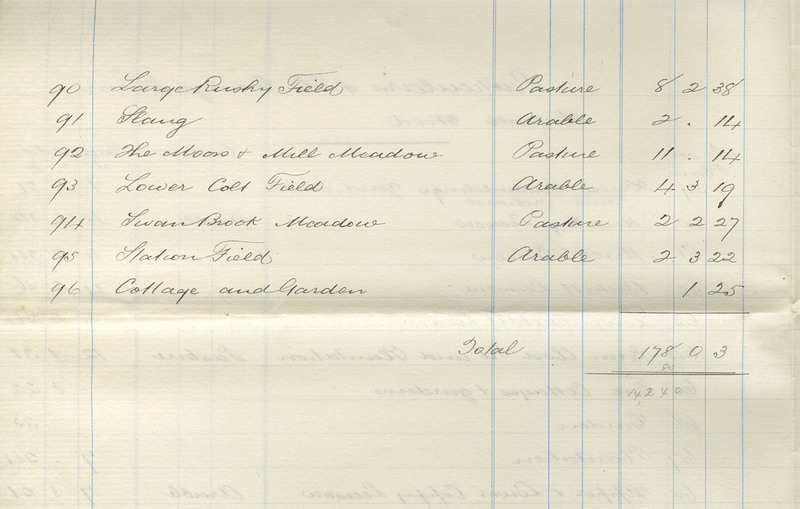 Details of the farm sheet one - are any of the fields known by these names today? image supplied by Paul Ford/Walsall Local History Centre. 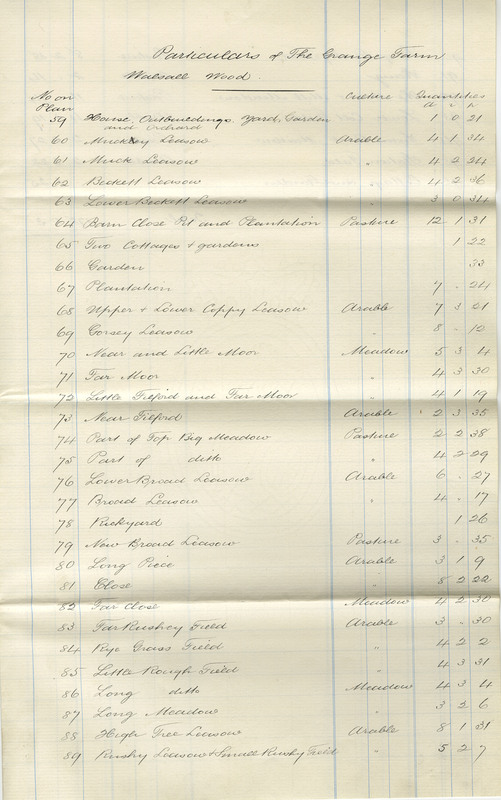 Details of the farm sheet 2. Image supplied by Paul Ford/Walsall Local History Centre. I thank Paul for his remarkable contribution to the blog, and I’d like to draw readers attention to some of his other great contributions, on the subject of the local mortuary, Yates Map of Staffordshire, The great Walsall Wood subsidence mystery and last week’s Billy Daft autograph. Paul is just one of the team at Walsall Local History Centre who provide a largely free service to everyone interested in the history of their area and the history of the wider Walsall Borough. Staff there are highly trained, knowledgeable and ready and willing to help both the novice and experienced researcher alike. If you haven’t popped in yet, the centre is in Essex Street in North Walsall. Details of opening hours and facilities are available of their web page. You’re assured a warm welcome. This entry was posted in Bad Science, Brownhills stuff, Clayhanger stuff, Environment, Features, Followups, Local History, Local media, Reader enquiries, Shared media, Shared memories, Social Media, Walsall community, Walsall Council and tagged Albert Henry Snape, Albert Paley, Arthur John Snape, Brownhills, Brownhills local history, Brownhills UDC, Brownhills Urban District Council, Bullings Heath, Clayhanger sewage works, effluent, Emma Snape, Grange Farm, Local History, Paul Ford, pollution, Public analysts laboratory, Samuel Brawn, sewage, Staffordshire, UDC, Walsall, Walsall Council, Walsall Local History Centre, Walsall Wood, Walsall Wood Sewage Works, William Thomas Edwards. Bookmark the permalink. Interesting stuff, but I’m intrigued by the reference to land owned by the ‘Governors of Queen Mary’s School (Walsall)’ on the 1921 map. The school owned bits and pieces of land, properties and farms all over the place. They were set-up in 1554 with grants of land by Queen Mary and used the rents etc to fund the school. Land was held as far away as London. We used to hold the deeds, but the school decided to take them back last year. We have the original foundation charter. Queen Mary’s Grammar School, founded 1554, originally on Church Hill, adjoining the churchyard, Walsall. Queen Mary’s School has a long history. In 1553, John Dudley, Lord of the Manor of Walsall, was beheaded for treason and his estates including the rectory and chantry lands of Walsall were confiscated and the inhabitants of the town determined to secure the assets for themselves. A petition was taken to London by Nicholas and George Hawe to request that the lands become the property of the Crown and that a Grammar School be founded for the permanent benefit of the school. This received the Royal assent by Letters Patent of Queen Mary in July 1554. The free Grammar School of Queen Mary at Walsall was thereby established ‘for the erudition and instruction of boys and youths’ and the control of the school was placed in the hands of Governors. In September 1893, a High School for girls was opened in connection with the Grammar School. The original Grammar School was situated on the Church Hill in St Matthew’s Churchyard. In 1813 it was moved to premises in Park Street and in 1847 it moved again to Lichfield Street. The Grammar School is now situated on Sutton Road while the High School occupies the buildings on Lichfield Street. From 1554 to 1797, the rents of the estates were practically the only source of income, meaning Queen Mary’s School (QMS) depended upon the prosperity of agriculture, and the skill of the Governors as landlords. Industry made only a small contribution as an income source. With sale of the Tipton mines in 1800, the funds began to owe much to interest which was reinvested up until 1822, after which is was paid annually to the Governors. In 1854, the first QMS land was sold on a building lease (at Bloxwich and Birchills). In 1872, the first ground rents were purchased (the Warston Lane Button Works, Birmingham). Other ground rents bought by the Governors lay in Aston Road and Warstone Road (Birmingham), Mansell Road (Wimbledon), Kelross Road and Northolme Road (Highbury), Gleneagle Road (Streatham), and Rosewood Road (Acton). Fees were first charged in 1873 (£5 per annum). Between 1893 and 1906, the Walsall Wood estate became a colliery and from 1906 to 1924 the Governors received royalties. At the same time, between 1904 and 1906 (as a result of the Balfour Act of 1902) the first direct government grant was received, and in 1921, the borough and county made their first local grants. At this time there were many offers made to purchase various properties belonging to the school and the process of selling began.